Agency partner Imre is working on the account out of the Los Angeles office and "set out to discover what homeowners and trade professionals really wanted in a lock brand," said Christine Zippert, GM of IMRE's Los Angeles office. LOS ANGELES: What’s a brand to do when its standout identity gets buried under everyday speak? For Kwikset, it took a look inward to rebrand on the outside. 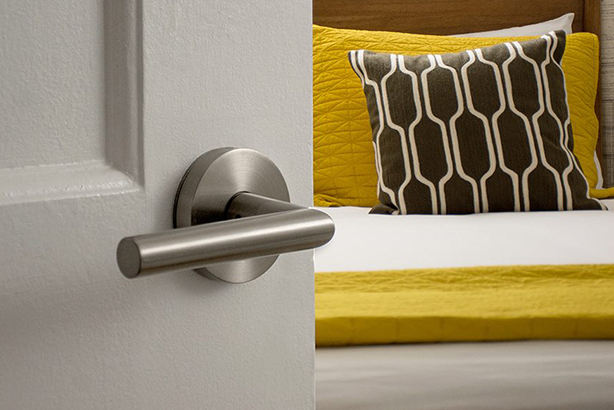 Formerly touting "smart security is the best security," Kwikset realized that over the past few years, the word "smart" went from being something audiences could identify it by to an "overused and convoluted" term, said Marty Hoffmann, VP of marketing. "[We] saw it used 80 million times online last year alone," he added. Hoffmann said the door hardware space is become more and more a "lifestyle category," one in which Kwikset feels it fits nicely. "So we did a lot of self reflection," he added, and that factored into the company’s new brand platform: "Made for the world you live in," which Hoffmann said represents Kwikset’s overall culture. Agency partner Imre is working on the account out of its Los Angeles office. "[We] set out to discover what homeowners and trade professionals really wanted in a lock brand," said Christine Zippert, GM of the firm’s Los Angeles office and account director. "They want a stylish, innovative, security-driven lock." Kwikset’s new campaign is totally consumer facing, noted Zippert, because "every consumer wants a product that’s exactly right for their home," whatever that individual need might be. Ryan Jordan, VP and creative director at Imre, said an integral piece in creating the campaign was to "really get inside the homes of consumers." With the help of a builder-interior designer couple, Imre and Kwikset found a specific story to share. "We created a really targeted campaign so that we are able to talk to specific audiences," Jordan explained, adding that it "hits on the popularity of the HGTV network" and similar programming that has become increasingly popular. The integrated campaign lives primarily on YouTube, Twitter and Facebook, said Zippert. It will continue to introduce new families with their own stories of how Kwikset fits into their lives. She added it was important for the campaign to "make an emotional connection" with consumers and "be relevant, even when the consumer isn’t in the market," because a major challenge for Kwikset is the lifespan of a lock. "You might not be in the market for seven, 10, 20 years," she said.